Many times I have walked by all the fun gel pens on the shelves in all the art/craft stores and wondered what would I do with them. When the opportunity for learning something new using these colorful pens came up, I readily signed up. 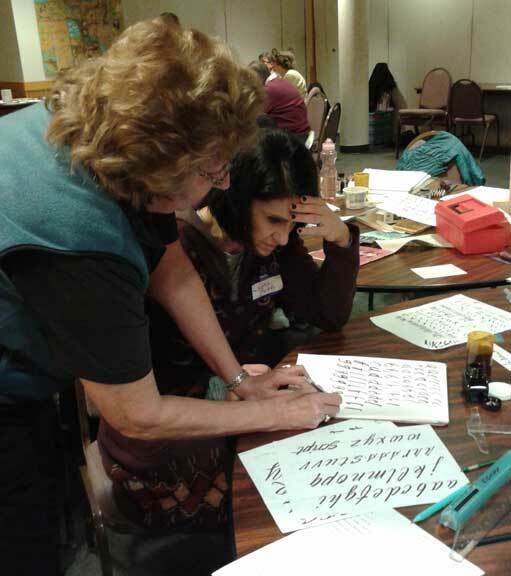 Jean Heidenreich and Eve Brown were good instructors and used patience and skill to step us through the technique often referred to as “stippling” or “Pointillism.” Mostly it was fun making dots to outline the shape of a stencil in the shape of a letter. Sounds simple, doesn’t it? Well, it is! It can be used by anyone old or young regardless of their skill with a calligraphy pen. In regular calligraphy your ink creates the letter form. 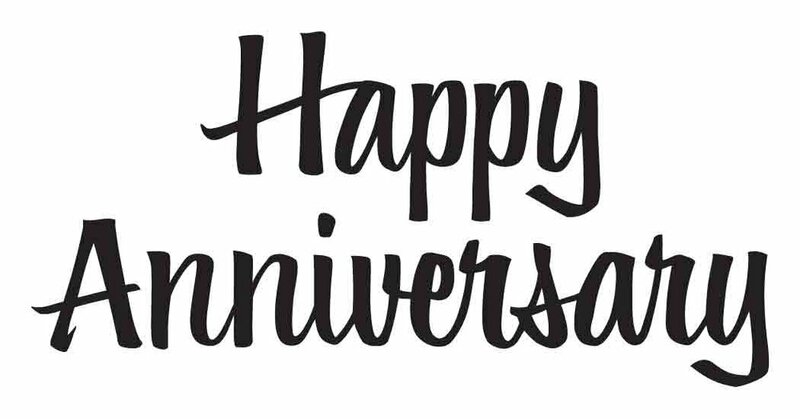 With the technique we learned, the letter-form was stenciled onto the paper creating a counter space in the shape of the letter. We started out by stenciling the word we chose on black paper using a pencil. Then we started to make dots sparsely around each letter, and then proceeded to fill in more dots to give it a denser outline. 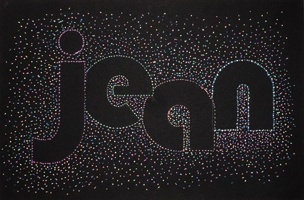 Whether you used one color or many, the results are stunning, especially on black paper. The letter “lit up” as you put dots around it, making the word magically appear like a neon sign. Alphabet stencils were used to outline each letter in any arrangement. They could dance across the page jumping and skipping up and down, or overlapping them to give the appearance that each letter supporting the other. Doing a single initial or shape had a stunning effect, too, and would make great gift tags/cards or bookmarks. This technique is very relaxing. The rhythm and flow of lifting the gel pen up and down to leave a perfect round dot on the page requires focus. Try doing this with music in the background and make dots to the beat of the song. You will see your name in lights when you are finished. It was fun learning something new and different. I can’t wait to see what the Colleagues will offer at next year’s mini workshops. As a novice I greatly appreciated the down to earth basics taught in this session: how to pick and clean brushes, what size might work best for a beginner, how the pointed brush is different and in some ways more versatile than a chisel-edged pen. Others commented that they thought the session was a "great idea for newbies and the more experienced participants seemed to enjoy it, too." No matter who you were, the one-on-one assistance Karen provided as she went around was invaluable. Karen was knowledgeable, friendly, and relaxed as a teacher. She handed out several alphabets for continued practice after our afternoon of watching her demos and trying our hand. Students appreciated Karen's very helpful instructions and attention to specific detail, with appreciation for allowing students to try her tools and sharing books and resources. Karen also brought several resource books to look at so we could choose what we might want to buy for our continued study. All in all it was a very fruitful afternoon; so much so that as one participant said, "I wish it could be a week!" Sue came well prepared with a packet of supplies and instructions for each of us. 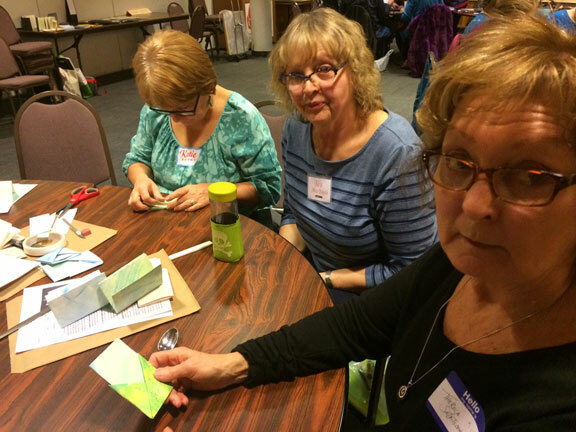 This “no binding needed” paper book and origami sleeve was easy to create thanks to everyone helping one another – and great instruction. One participant was overheard happily exclaiming: "No needles, no thread: this is my kind of a book. I don't do needle work!" We used Arches Text Wove paper that had been prepped with matte medium and a little acrylic paint in a wide variety of colors. This gave the paper a bit of tackiness that gave added strength to the feel of the final product, if not making it a little challenging to fold. The varied marbling and brush strokes of color ended up crossing and contrasting as we folded, creating new little pieces of art as we progressed. The folding was done in two different sequences on two different size papers, one each for the book and its sleeve. 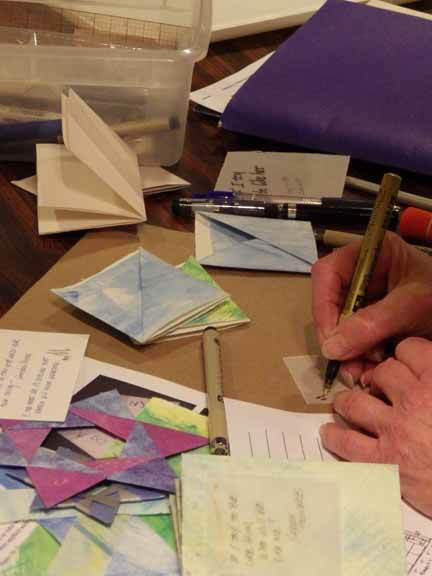 Sessions like this are where you can learn from your teacher or classmates some little tricks you might otherwise figure out the hard way As an example, one classmate suggested not using a completed crisp crease on all the folds to ensure more flexibility and adjustability when making the final folds. How handy! Next we moved on to lettering in our books (we are calligraphers, after all). Sue shared Copic Multi Liners from Wet Paint (which can be refilled, and the points are replaceable!). The Niji Stylist also worked well and several of the brush pens made nice embellishments. In addition, we used Gampi (Japanese translucent paper) in small patches to add lettering over the page-coloring. The YouTube video link she shared was provided to help master these sturdy little books. Click here to view. Once you get the hang of folding, it's easy to see how these little books in their sleeves are the gift that keeps on giving. You could set out a stack of paper and start folding, folding, folding. Next thing you know, you could have a little pocketbook library at your fingertips. In addition to the reviewers, many thanks go to the workshop participants who snapped photos: Ann Ryan, Lynn Ohlhorst, Sandra Muzzy, and Maura Lynch. Older PostNovember 2016 Program Review: Not Your Grandma’s Uncial!